If you tuned in to the first episode of Love & Hip Hop Atlanta, you were introduced to rapper Lil’ Scrappy’s mother, Momma Dee. When Momma Dee says she use to be a pimp back in the day, she really used to be a pimp. She says, in an interview with eurweb.com, that she left home at an early age because of physical abuse from her stepfather. She successfully went on to get a bachelor’s degree in nursing. She says she was hit in the head and on crutches for three years. One of her patients told her about running a call girl service. She eventually opened up trap houses in Atlanta. She hustled for ten years until Scrappy’s career jumped off. He told his mom that he wanted her out of the business before she got into trouble. Momma Dee is one of the most popular cast members on Love & Hip Hop and is famous for her funny quotes. “In That Order” being her most repeated. Her presence on the show should make it interesting and exciting. I can’t wait!! Follow Momma Dee on Twitter @therealmommadee. I was going over some footage of the Hot 107.9 Birthday Bash last night and ran across something. My V.I.P. invite must have gotten lost in the mail, (I had to work late at The Boutique anyway) so I had to resort to YouTube. Ludacris performed and brought out some special guests. First Uncle Luke performed his 1984 hits wit some strippers who looked 84. Come on Luke. When they say ‘as nasty as they wanna be’, they wasn’t talkin ‘bout yo strippers! Next Luda did the remix to “My Chick Bad”. In the words of the King, Mr. T.I. himself, Lil’ Scrappy PUHLEEEZE, ‘Come and Get Yo’ Girl’! Diamond came out there looking like an extra on the set of Glee. Boo, how you gonna have on a leotard four sizes too big? That ain’t cute at all. 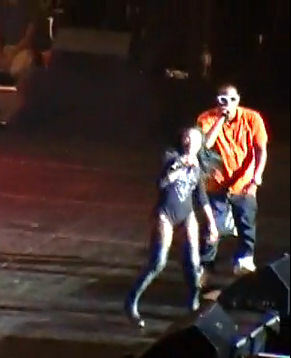 THEN the baddest b$%#h herself Trina, comes on stage, and you know her outfit was fitting like a glove. If I was Diamond, I would have eased my a$$ right on over there by the speakers, jumped down in the crowd and disappeared for the night. Trust me nobody would have missed her. I don’t like to talk about people, but damn! Sometimes I wonder what do artists look for when signing with a record label? Is it the labels history, their credibility with their audience, their roster, or simply how much are they getting paid. For example, what would make Shyne sign with Bad Boy (or anyone else for that matter, i.e. Day 26, Danity Kane, Dream, Total, Carl Thomas, The Lox, New Edition…..the list goes on and on.) or Bow Wow sign to Cash Money. So when I found out Lil’ Scrappy recently signed to Ludacris’ label DTP, I tried to be optimistic. Lil’ Scrappy, formerly signed to Warner Music Group, complained that Warner was more of a rock and roll type label and that he left because he wasn’t able to find the proper promotion. Scrappy ended up on Warner’s label because he was signed to Lil’ Jon’s BME Recordings. During this time Scrappy developed a strong fan base from his song, ‘Head Bussa’. Lil’ Jon struck up some kind of deal with Warner to take his label there. Luckily, Scrappy was able to leave Warner without any problems. I hope he thought this out. The game misses Scrappy. In the meantime, look out for Lil’ Scrappy’s mix tape ‘The Shape Up’. It features every ones favorite rhyme spitter Gucci Mane.